IT’S ALL GRAVY: That unique gravy for Swedish meatballs is a roux made in the same pan as the meatballs, sometimes fortified with sour cream for maximum creaminess. And lingonberry jam is the traditional side, but anything sweet can work. Swedish meatballs are known for their smaller size, creamy gravy, sweet side sauce and party-ready persona. They’re a traditional part of a Swedish smorgasbord, and until recently were relegated to odd curiosity-but-ultimately-pretty-bland 1970s potluck food category. Now, they’re coming back in a major way. Jamie Baribeau, director of food and nutrition at Brattleboro Memorial Hospital, says he can’t help but thinking of the 1970s when he thinks of Swedish meatballs. Ikea is almost single-handedly responsible for the renaissance of Swedish meatballs we’re enjoying today. The company serves one billion of them worldwide each year. The uber-popularity of their Swedish meatballs (they serve one billion of them worldwide every year) has only inspired them to introduce new products. “A lot of our consumers look for healthier alternatives,” Ho says. So in 2015, they unveiled both vegan and chicken versions of the meatball in Belgium and the U.S. So at Brattleboro Memorial Hospital, Baribeau has decided to create his own recipe for Swedish meatballs as a new menu item next month. “We’ll do our own version with Vermont grass-fed beef and pork with some nice spices and local heavy cream or sour cream,” he says, adding that he’ll share the recipe with FM readers once it’s finalized. Stay tuned! STOCKHOLM SYNDROME: Ikea helped Swedish meatballs become popular once again. Here, at UNC, the meatballs have morphed into shareable sliders. While there’s obviously nothing missing from the classic version, a slight reinvention of the wheel can make Swedish meatballs much more portable. 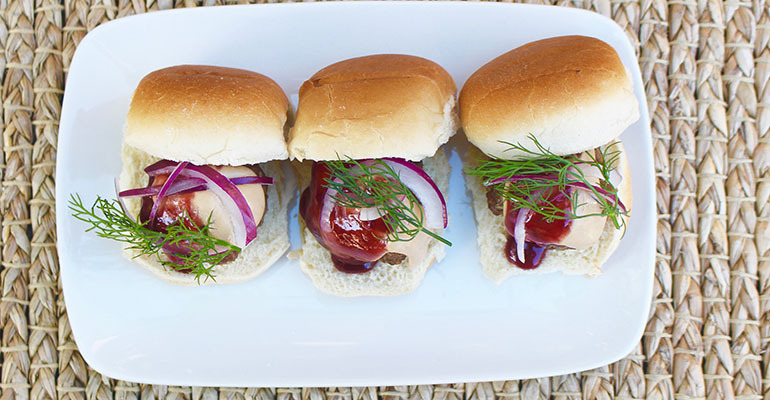 At the University of North Carolina-Chapel Hill, Swedish meatballs are showing up in slider form. These adorable snack-sized bites are topped with sour cream, allspice sauce, berry-horseradish and havarti-dill cheese. A garnish of red onion and a sprig of fresh dill sets off the finished dish perfectly. When preparing the meatballs, University of Montana Executive Chef Brian Heddlesten prefers a ratio of 2:1, beef: pork. “It gives a lighter texture and more depth of flavor,” he says. Getting a brown crust on the meatballs give them a better flavor, too. Heddlesten recommends a few moments in a hot skillet for the meatballs first, being sure not to crowd them, or you’ll end up steaming them instead.